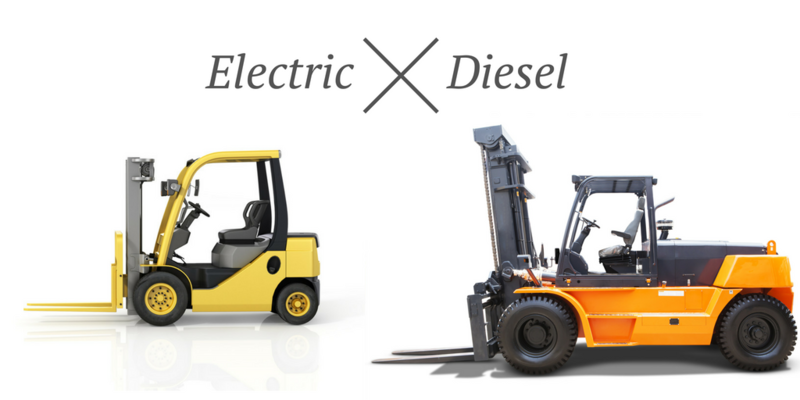 Diesel Forklift or Electric Forklift? Which is better? Forklifts are an essential part of any large warehouse or type of workplace that carries, stocks, and transports heavy materials. They are one of those tools that modern technology has gifted our culture to speed up, improve, and make once impossible tasks now possible. There are a few different types of forklifts that offer varying advantages and disadvantages. The electric forklift and diesel forklift can be seen in warehouses and work sites across the country, and are each used for specific tasks. The way a forklift is powered makes a difference in how it performs, how easy it is to use, how much it costs to run and maintain, and how it impacts the environment. If you’re an employer or the owner of a warehouse and aren’t sure which type of forklift is best for your company, its working processes, and your operators, review our guide and learn the pros and cons of electric and diesel forklifts to decide for yourself. The right decision can have positive impacts on the productivity of your workplace, can decrease everyday costs, and can help reduce accidents. Electric forklifts are the environmentally-friendly option compared to diesel forklifts. They do not release emissions into the air that can hurt the planet and living beings, and they are much quieter than diesel forklifts due to the battery power source. Pros: Electric forklifts are the best option for use in indoors because they do not emit toxic fumes where employees work and breathe, and are not loud when operating. When indoor workers are working around blind spots and corners and cannot hear each other or machines due to the loud noise of equipment, the risk of accidents occurring is much higher because workers are not adequately aware of their surroundings. Electric forklifts are also more compact than diesel forklifts and are much easier to operate and maneuver around tight spaces such as the aisles and corners of a warehouse. Electric forklifts do not require the operator to use a clutch and therefore are easier to control. Electric forklifts are also less expensive to maintain than diesel because they have less moving parts that can break or become damaged and they only need to be recharged to work and do not need a tank to be filled. Cons: Electric forklifts are your convenient option if you only need them for indoor work and you don’t need to use them all day long. That being said, their disadvantage comes in the form of the limitations of their battery. The initial cost of a battery and charger is higher compared to diesel fuel, and electric forklifts must always be charged up before they can work. Unless a warehouse has a fleet of forklifts that are always ready to go, electric forklifts can be very frustrating when an operator must wait until the battery is fully charged to get to work. Electric forklifts are also not the best choice for outdoor work and they cannot be exposed to the elements like rain or snow due to the vulnerable electrical parts and circuitry. Diesel forklifts use diesel fuel to run, unlike an electric forklift that uses a battery. They are ideal for use outside on rugged terrain and in various weather conditions. While diesel forklifts are louder than electric lifts, they are more powerful and their energy is not as easily depleted. Pros: Not having to rely on a battery, diesel forklifts are accessible around the clock and all they require is a refill on gas. The time saved simply adding more fuel versus waiting for a battery to charge can be significant for workplaces, improving productivity. No extra space is needed to reserve for battery charging stations for forklifts and diesel forklifts can be parked wherever it is most convenient. The power and performance capabilities of diesel forklifts are much greater compared to electric forklifts which are quickly depleted in battery energy after driving on gradients. Extra attachments that are added to a diesel forklift, like hydraulic attachments, do not affect its power nearly as much electric forklifts. The more components that need power from electric forklifts, the faster the battery and overall power of the forklift is depleted. Cons: Diesel forklifts should never be used indoors, or in close proximity to workers because the noise and toxic fumes emitted can create hazardous working conditions. CertifyMe.net provides forklift training that reviews everything you need to know about using diesel forklifts indoors. Our training provides a complete assessment of OSHA’s Enclosed and Hazardous Areas learning tool. Handling toxic fumes requires careful assessment of indoor air quality, safe practices for eliminating carbon monoxide, and general awareness of enclosed spaces. This is the biggest con about diesel forklifts indoors, but there are few others. Being bigger and bulkier than electric forklifts, diesel forklifts do not offer as many uses as electric powered lifts, not being able to easily or safely maneuver around corners and tight spots. Maintenance costs are usually higher for diesel forklifts because there are more moving parts to look after. Both diesel and electric forklifts come with their own benefits and drawbacks. Each is capable of lifting, loading, and transporting heavy objects within a warehouse and workplace, but the biggest difference that separates them is their usage. Diesel forklifts are larger, fuel powered, more powerful, and are used outdoors. Electric forklifts are powered by a battery, saving costs on fuel but increasing the responsibility of the worker to always have them charged. They are more compact, have a smaller swiveling radius, and are best for indoors traveling through aisles and around corners and tight spots. Neither is better than the other and each offers its own unique qualities to get the job done right in the various areas of your workplace. Employing each type of forklift can help you make the most of the working processes and allow for the highest level of productivity and efficiency possible. Do I Need Electric Forklift and Diesel Forklift Training? Now that you know of the major differences between the electric forklift and diesel forklift, and their pros and cons, the next step is to consider training. What kind of program should you look for, and do you need a separate training for each, or one that combines both? At CertifyMe.net, we have the answers. Whether you use electric forklifts or diesel forklifts in your workplace, you need a training program that will equip your workers with the knowledge they need to operate the equipment safely, and prevent accidents. We’ve created a course that teaches workers how to operate both electric and internal combustion (gasoline and diesel) Class 1, Class 4, and Class 5 Warehouse forklifts, as well as Class 7 Rough Terrain forklifts. As you know, an electric forklift and diesel forklift are very different machines that require different skills and environments to operate, but our online course teaches both in the most efficient way possible. Trainees of our program will learn the specific skills needed to operate electric forklifts indoors for various tasks, and diesel forklifts outdoors for construction work. Plus, it helps to know the different hazards with all types of powered industrial trucks – including the use of a diesel forklift indoors. According to OSHA’s Enclosed and Hazardous Areas e-learning tool, it’s critical to ensure proper ventilation when operating a diesel forklift indoors. Your designated location, indoor air quality, and carbon monoxide assessments are very important for worker safety. Some forklift injuries and accidents are caused by using a diesel forklift indoors. With training from CertifyMe.net, you’ll have everything you need to become safer on the job. Training is the most effective way for forklift operators to prevent accidents that can cause injuries, deaths, and costly equipment damage. It also helps keep businesses out of the way of fines and legalities. We make it easy, convenient, and affordable to receive the electric forklift and diesel forklift training your workplace needs to combat unsafe practices. You can choose the specific type of forklift training you need, or bundle and save with our all-in-one Training Kit. If you only need warehouse forklift training, choose that course. If you only use rough terrain forklifts on your work site, go straight to that training. CertifyMe.net is an online forklift training school that teaches workers everything they need to know to operate a forklift, inspect the equipment, assess the surrounding environment, and avoid hazards. The program is 100% OSHA-compliant and only takes about one hour to complete. For only $49.95, your workers can receive either electric forklift training or diesel forklift training, and be prepared and certified to recognize and prevent accidents in your workplace. Or, you can pay a one-time price of $299 for all of the training courses we offer. All you and your workers need is a device with an internet connection to have access to all training modules, 24/7 365 days a year. On their own time at home or during a lunch break at work, your employees can train at their own pace, without having to travel to an offsite facility on time-off, at your expense. You won’t find a more convenient or affordable electric forklift and diesel forklift training program out there. We’ve put our industry expertise together with all the required standards to meet all OSHA regulations. Your workplace will be 100% OSHA-compliant, safer, and more productive. That means more profit in your pocket, and far fewer accidents in your workplace. Free three-year renewals for life! Become an expert in the electric forklift and diesel forklift with CertifyMe.net today! Our training will show you how to safely use diesel forklifts indoors, different hazards to pay attention to, and other crucial information. With our complete line of OSHA forklift safety courses, you and your company will enjoy a safer workplace. Ideal for both employees and employers, the training classes at CertifyMe.net provide a thorough review of the most up-to-date information and safety requirements for using electric forklifts and diesel forklifts in all sorts of environments, including indoors. Don’t take chances with your safety program – contact CertifyMe.net for the best OSHA forklift training you’ll find anywhere. If you need a refresher on using a diesel forklift indoors, or if you’d like to give your resume a boost – employers all across the U.S. are looking for well-qualified forklift operators all the time – contact CertifyMe.net today. Click here to view our forklift training courses and pricing. To speak directly with our OSHA safety experts, give us a call at 1-888-699-4800. This post was originally published in 2016 and updated with new content in 2018.